SeizureTracker.com - Retrieve your Seizure Tracker log in information. Seizure Tracker has a tool to easily retrieve your log in information using the email address associated with your account. -From the Seizure Tracker home page click the "Forgot User Name/Password" in the upper right corner. -You will be forwarded to the Log In Retrieval page. Enter in the email address associated with your account (entered in when account was set up). 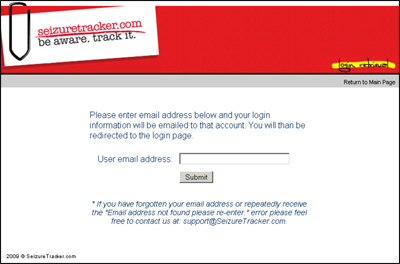 -After entering email and submitting it you will be directed to the Seizure Tracker home page to log in. 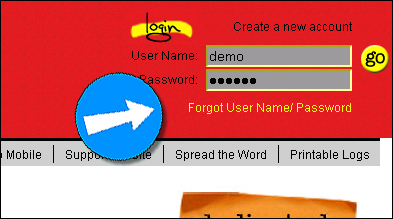 Your user name password will be emailed to the account you entered (if it is associated with an account). If for some reason you are unable to get your log in information using the retrieval tool please feel free to contact us at: support@SeizureTracker.com.